We aim to deliver a professional and caring service through our sympathetic, competent and trained staff. Our priority is to ensure that all funerals are organised and conducted in a dignified and orderly manner, as we understand that a meaningful funeral is an important part of the grieving process. 10am to 4.30pm including Saturdays, Sundays, Public Holidays, Christmas and New Year. Please note that the side gates will close at 4.15pm and the main gate at 4.30pm. 10am to 6.30pm including Saturdays, Sundays and Public Holidays. Please note that the side gates close at 6.15pm and the main gate at 6.30pm. Visitors are welcome to park by the chapels or on the wider path sections if space is available. If parking on the path side, please do not block access for other vehicles, mount the grass, or encroach on graves and memorials. Please exercise care whilst driving in the cemetery. If you are attending a funeral please be aware that it may not be possible to accommodate all vehicles on-site. We reserve the right to restrict the number of vehicles permitted to park in the cemetery. This will ensure that the funeral procession has clear access to enter and exit the cemetery in a dignified manner, and to maintain safe access for all other cemetery users. Please consider using nearby on-street parking where possible. The office is open Monday to Friday from 9am until 5pm, excluding Public Holidays, Christmas and New Year. If you plan to visit the office please contact us and we will make you an appointment. As we attend each burial, and are often out of the office with families, there may be occasions when the office is not staffed. An answer phone service is available if your call cannot be answered personally. Please leave a short message giving your name, contact number and a brief description of your query, and a member of the team will get back to you. 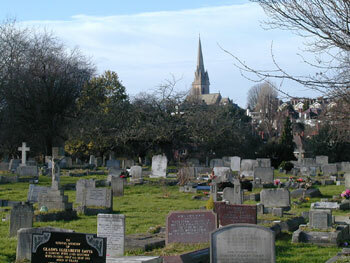 There are two cemeteries in the Borough of Richmond upon Thames which are managed by Hammersmith and Fulham Cemeteries Department. These are North Sheen (also known as Fulham New) and Mortlake (also known as Hammersmith New). Telephone is 020 8878 1934.